Usually Uluru or Ayers Rock is often called as world’s largest rock. 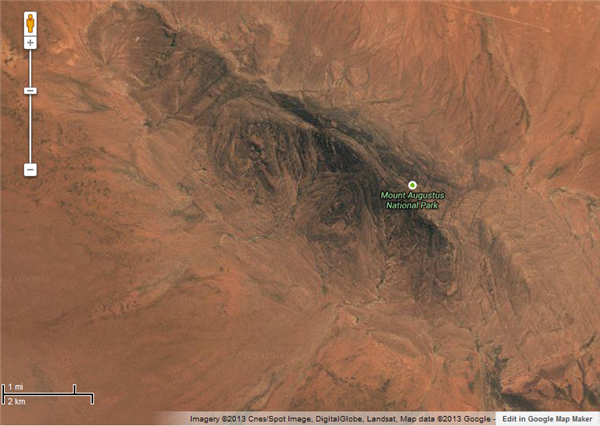 But in fact Uluru is more then 2 times smaller size comparing with Mount Augustus. I am sure somebody will start argue it is different type of rock. One is monocline and another is monolith. I am not planning be involved in such discussion, but you can check this talk on wikipedia if you are interested. Mt. 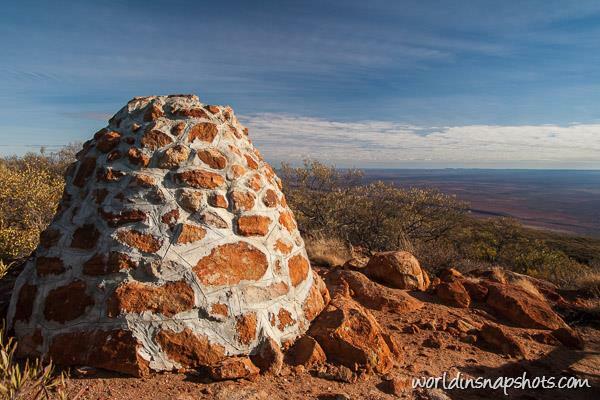 Augustus, or Burringurrah as local aboriginals call it, raises 1106 meters ( 3629 feet) above sea level. It is 8 kilometers (5 miles) long and 3 kilometers (1.5 miles) wide. Circumference of Mt August is about 30 kilometers (~16 miles). For comparison Uluru circumference is slightly more then 9 kilometers (~6 miles). There is no base walk, but you can take 49-kilometer drive around the rock with access to some creek gorges and Aboriginal rock engravings. Getting there is one of the exciting parts of the trip to Mount Augustus. It is very remote place. Nearest city, Carnarvon, is located 430 kilometers (~270 miles) West from the mountain and 360 kilometers (~225 miles) East there is small town – Meekatharra. I was driving from Meekatharra to Mount Augustus and then to Carnarvon and most of the road was unsealed, but it was good enough to drive my small 2WD camper van. Of course it is better to check latest information about roads condition on Main Roads Western Australia website, as some roads can be closed or in bad condition and not suitable for campervans or 2wd cars. As you understand it is remote place so you must carry plentiful of fuel, water and supplies. There is fuel at Mount Augustus Outback Tourist Park and in Cobra, but gas prices are almost 50% higher what you would pay in Perth or Carnarvon. In Cobra I found probably most expensive fuel in Australia. There is one interesting thing I found during preparation for this trip. 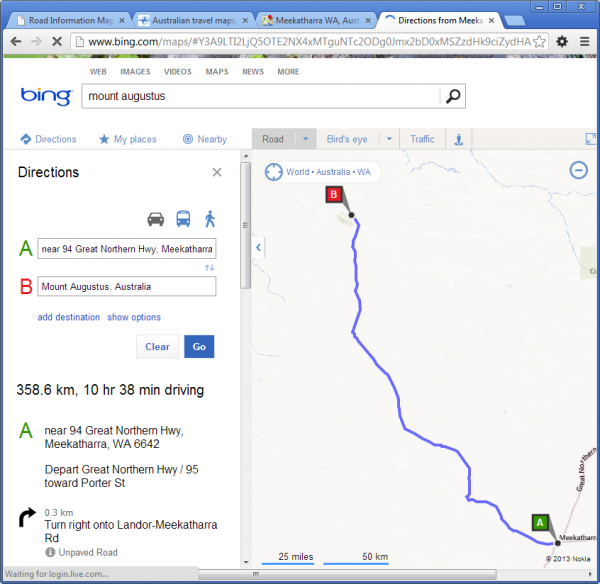 Google Maps couldn’t show you direct route to Mt Augustus from Meekatharra. It is already couple years passed since my trip, but Google Maps still shows you wrong route. I wouldn’t mind if it would be couple km difference, but in this case it is additional 200km (125 miles) and 5 hours more driving. So it is better to use Bing Maps for online route planning. Duration of the trip is another important thing to note. All online route planners and GPS applications take average speed 30km/h (20miles/h) if route goes on unpaved road. That is why it shows almost 11 hours driving. 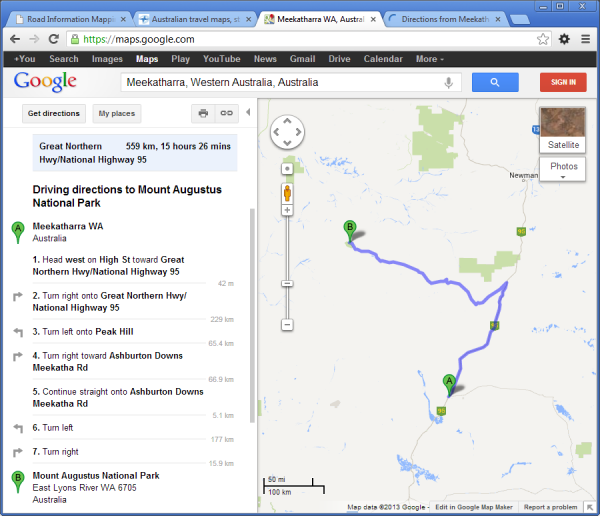 In reality it took 5.5 hours for me to get from Meekatharra to boundaries of Mt Augustus National Park. So actually it was ~60km/h (38miles/h) average speed. I did get up early in Meekatharra and at midday was near the mountain. 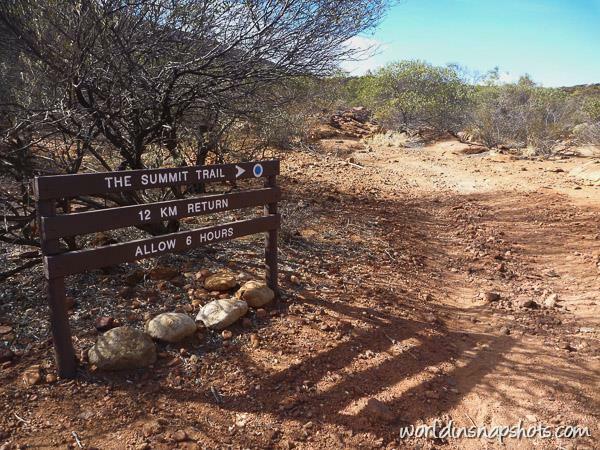 There are two trails to the Mt Augustus summit: one is called Summit trail (class 4) and another is Gully Trail (class 4/5). Both trails are 12 km (7.5 miles) return. 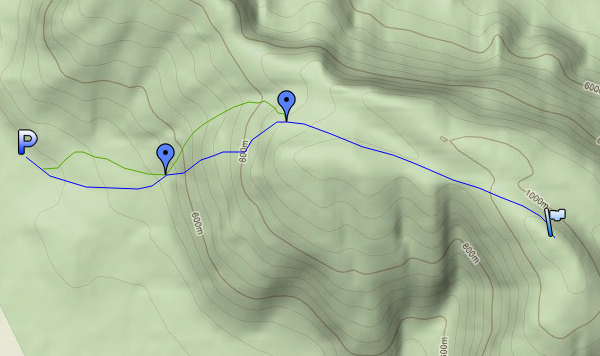 After first 3 km (2 miles) Gully trail links into Summit trail, so only first part of Gully trail is more challenging trail and park’s guide recommends additional hour each way if somebody choose Gully trail (marked in green colour in map bellow). According DEC brochure it takes average 6 hours return on Summit trail and 7 hours return on Gully trail. It is easy to calculate how much time you will need on the trail if you did any trekking on other national parks. I usually recommended time divide by 2, so expected to spend ~3 hours on Summit Trail and that was very accurate assumption. It was no other people on the top and I could enjoy the view just by myself. I was happy I did this climb and didn’t climb Uluru rock. Really why should I climb most pretty rock (Uluru) then I still can climb largest rock in the world instead? P.S. 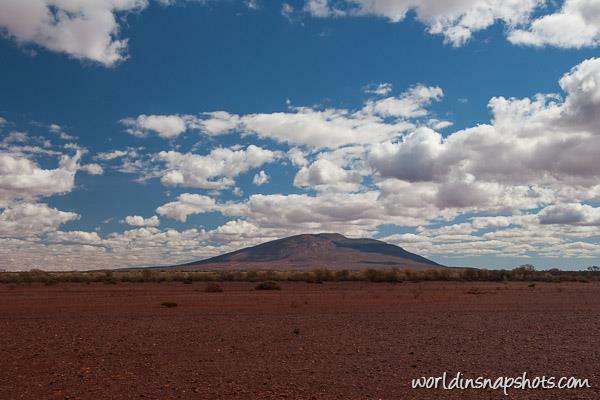 In winter temperature is not such high at Mount Augustus National Park, but it still reach average 25C (77F) and with clear skies it can be really hot. So it is better to climb in the early morning. I started my climb at dawn and may be that helped to reach summit faster. Such an amazing place and views, you are lucky to be able to visit it! I hope some day I’ll come to Australia, it’s my dream 🙂 Thanks for sharing! Fantastic overview with great detail. One of Australia’s wonders that hardly anyone knows about just wanting to be discovered. 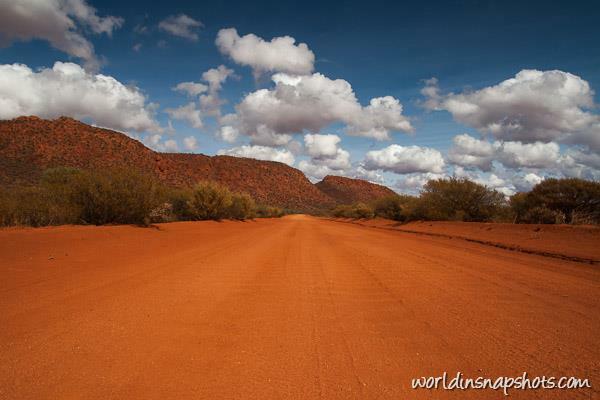 If you had to choose between this one and Uluru to visit, which would you choose/recommend? Uluru, because Mt. Augustus is hard to get to and in Red Center there is not only Uluru. 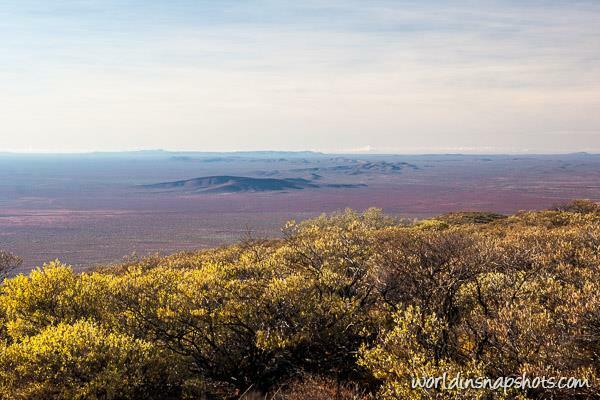 Olgas are only couple kilometers away and Kings canyon also is not so far away. Also, Uluru is not as far from the nearest major town (with nearest Domestic Terminal for flying). But if you’re looking for a good family camping adventure, you’re way better off going to Mount Augustus.